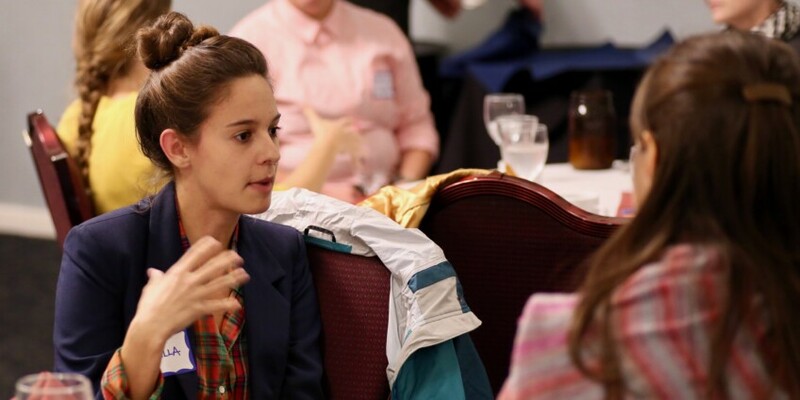 Vermont Businesses for Social Responsibility and the High Meadows Fund launched the third annual Vermont Changemakers Tableprofessional network for mission-driven young Vermonters. The Changemakers Table is designed to help members meet with and learn from experienced Vermont professionals who have used their careers to influence the state’s environmental, social, and economic future – and to learn new tools for change and policy engagement. At their second meeting next week in Northfield the group will host guest speakers Sha’an Mouliert a social justice activist from the Northeast Kingdom and Simone Washington the Social Mission Strategy and Policy Manager at Ben & Jerry’s Homemade, Inc.for a discussion on how businesses and young professionals can better orient their work toward social equity and justice. The group met in Montpelier for the first of four dinner meetings in September where they had time to network and participate in facilitated discussion, as well as meet and dialogue with Vermont social entrepreneur Sascha Mayer, Co-founder of Mamava. Sascha shared experiences from her own path to socially responsible business ownership. Through the application process, the Changemakers share what issues facing their communities are of most interest to them, and those issues shape the group’s conversations and roster of guest speakers. Discussions cover topics such as navigating an intersectional approach to policy work, finding the work that’s right for you and good for the world, and creating access for all Vermonters in the climate economy. The cohort members themselves represent communities from Hyde Park to Brattleboro to Waterbury, and industries ranging from fine art and higher education to housing development and victim’s advocacy. “It was refreshing and energizing to walk into a room of fellow civically engaged Millennials. Vermont is a small state. As we each get more involved, odds are we will be working together in various capacities,” said Monique Priestley of Bradford, a member of this year’s Changemakers Table. “I am thankful for Changemakers and hopeful for our generation of leaders.” Monique is exemplary of the Changemakers network, in addition to working remotely as Director of Digital for a Washington State based tech company she is the founder of The Space on Main coworking and community space, and serves on a number of Vermont non-profit boards including the Bradford Conservation Commission, Little Rivers Health Care, Cohase Chamber of Commerce, Vermont Council on Rural Development and is the president of the Cohase Rotary Club. To learn more about the program visit vbsr.org.